Floor lamps, especially modern floor lamps, add a sculptural presence to rooms while supporting your personality and individuality. Create any lighting effect by choosing the appropriate style of portable lamp, choosing from a diverse collection of torchiere lamps, retro arc designs, functional floor fixtures and well-made globe style lamps. Many floor lamp fixtures are fluorescent and LED, so they don't expel wasted energy and heat. Because of their portability, these floor lights are also a convenient choice when redecorating or moving furniture around a space to create a fresh new look. The versatility and portability of a floor lamp makes it a great fit in almost any room, and it can be moved anytime you choose to redecorate. First, consider lighting up the living room with a contemporary floor lamp. Contemporary floor lamps feature tall columns and low profile bases, making them ideal for corners and near reading chairs or couches. Arc floor lamps give living rooms a new, modern shape, establishing a multi-level designscape within the home, while reading lamps offer a wealth of focused lighting, giving you every reason to sit down and catch up on your favorite book or magazine. Home offices and dens also benefit from the light of a floor lamp, finding themselves at home near bookshelves, reading chairs and rocking chairs. When combined with a desk or table lamp, the right decorative floor lamp helps round out the space. And in bedrooms, a stationary lamps illuminate dark areas of the room while pairing well with lighting atop your nightstands. Anywhere you need a versatile lighting solution, you'll love the addition of one of these portable fixtures. This assortment of standing lamps span a wide range of traditional styles and transitional lamps to modern and contemporary fixtures that are sure to stand out in any space. If your home follows a transitional interior design style, you'll appreciate the designs and finishes in the collection from Arteriors. Modern floor lamps, like those from FLOS Lighting and Luceplan, have an elegant and unique touch that instantly puts your appreciation for good design on display. We especially love the design story that comes with these lamps, offering rich Italian history that makes the fixtures truly one-of-a-kind conversation pieces. Combine your love for Scandinavian design and mid-century modern goodness with a lamp by Louis Poulsen or Jonathan Adler. And if you prefer energy efficiency in your home, look to the sleek LED floor lamps available. Koncept's LED lamps, including the line of popular Z-Bar Lamps, are flexible and available in many options to fit your needs. While versatile and portable, floor lamps come in many sizes, shapes, colors and styles to choose from. When deciding how to choose a floor lamp, there are a few key things to remember. Use these steps to help you pick out the perfect lamps for your home. 1. What are the different types of floor lamps? 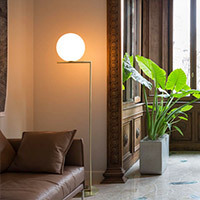 Floor lamps are offered in a multitude of types ranging from uplight lamps, torchieres, reading lamps, swingarm lamps, multi-arm lamps and arc lamps. Depending on your home's aesthetic and the purpose of the lamp, you'll have many options to choose from. 2. Where should I place my standing lamp? Knowing where you plan to position a floor lamp is important to selecting just the right type. First, you'll want to consider the lighting application you're trying to solve. Do you need a lamp for reading? What about one with a swinging arm for easy adjustability? Or is it simply a lamp to cast ambient light in the corner of a dim room? Ask yourself these questions and you'll be on your way to finding the best floor lamp. 3. What is the right floor lamp size? Although portable, size really does matter when it comes to a floor lamp. You don't want something too big that it takes up the majority of the floor space in the living room and conversely, you don't want something so small that it doesn't provide the amount of light you need. Once you know the lamp's application in your home, measure for height, width, depth and length (especially for lamps with multiple arms). 4. How bright should my floor lamp be? If you plan to use the lamp for reading purposes, you'll want to opt for an extra bright option. 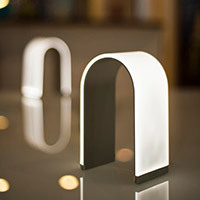 And if the lamp is more so for ambient light, choose a design with minimal light output. Be sure to check out the information on lumen output and check the lamp's required bulb type. While you'll find brightness with an LED floor lamp, you may prefer a floor lamp with a halogen bulb to give off more of a warm glow of light. 5. Can I use a floor lamp outside? In some cases, you may want to use a floor lamp on the deck, patio or front porch. You'll just need to check the lamp's UL rating to verify it is safe to use in wet or damp spaces where the presence of water is inevitible. Of course, thanks to the portability of these lamps, you could just take the fixture indoors as soon as you spot any bad weather. 6. How can I pair my portable floor lamp with other fixtures? Create a cohesive look in your space by accompanying your new floor lamp with equally stylish table lamps. You can also layer the amount of light in any give room with a well-chosen pendant light or chandelier, and splash some personality on your walls with sconces. If you have any additional questions about the floor lamps featured here, please call our lighting experts at 877.445.4486. Be sure to browse the complete selection of table lamps to further the consistency of your lighting design. 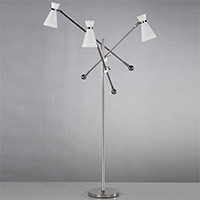 And pair your new floor lamp with a modern desk lamp too. You'll enjoy mixing and matching floor lamps, table lamps and task lamps to create well-designed rooms in your home. If a reading floor lamp doesn't quite fit your living area or provide the amount of illumination you need, check out the selection of wall reading lights. Unlike a standing reading lamp, these fixtures mount to wall and offer adjustable arms to give you reading light when and wherever you need it. Finally, take a minute to read into the best practices with how to layer lighting effectively using portable fixtures, ceiling lights, wall lights and more.